Since 2015, a nationwide phenomenon has swept through the hands and lungs of teens of all ages, making its way into every college, high school, and middle school in America. A wave that has seemingly appeared overnight has not only disrupted the order of the nation’s classrooms but has silently attacked the lives of every single child that has come into contact. What is the infamous trend in question? The Juul. A Juul is a compact electronic cigarette that sports a sheik metal outer shell. Not only does it provide easy-access magnetic charging, but it also takes pride in its wide range of attractive flavors, such as Fruit Medley, Crème Brule, Cucumber Melon, and several more. Many users are thinking of it as “the iPhone of e-cigarettes”, which Juul proudly advertises on its company website. The oversaturation of Juul’s youth targeted marketing has had a negative impact on teenage performance in school, health, and behavior, and may prove to be another epidemic equal to that of the cigarette. Over the past year the company referred to as “Juul” has been using social media platforms to advertise the company’s “healthier” cigarette alternative. The social media platforms are widely known amongst teachers and parents to be used by younger audiences. The company has utilized their colorful designs, youthful styling, and has even hired attractive models to help lure underage teens into wanting the age-appealing Juul brand e-cigarettes. Just recently, the FDA has threatened to shut down the marketing and distribution of Juul products, due to the blatant usage of these predatorial marketing tactics. 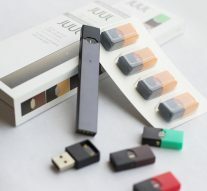 The ongoing investigation is determining whether or not Juul was indeed knowingly trying to appeal to a younger group in order to sell more of the company’s products. Operating similarly to early cigarette advertising, in which companies would use cartoons or child-like themes to advertise to children, the companies doing so were seeking out to establish a reliable clientele at a young age, gaining customers that would prove to be loyal for life. This form of marketing is clearly a gross misconduct, relying on the impressionability of the young mind to create a larger demographic. Although the company claims that the targeted demographic is adult smokers who are in need of a safer alternative to serve their addiction, the companies’ social media is chalk-full of young adult models hanging out in cafes, or with their group of friends, or many more different desirable settings to the young mind. Additionally, since the investigation started several months ago, JUUL’s various social media platforms have deleted many photos and other posts showing over-glorification of the “vape” lifestyle. If the company were truly not participating in this borderline abusive marketing tactic, there would be no reason for the posts to be removed. Instead of actively striving to change their advertisement methods in order to steer teens away from this awful habit, the company simply did enough to keep the $15 billion corporation in business. To this day, there are still advertisements being played on the radio for everyone in the vehicle to hear. Not only is this new e-cigarette obviously aimed to appeal to the nation’s youth, Juul is now affecting our children’s performance in school. Due to the products sleek rectangular design, the Juul bears a striking resemblance to the USB thumb drive, a tool that is used in the classroom of many schools on a daily basis. Teachers who are unaware of this product could notice a teen holding the device in their very hands and think nothing of it. After billions of dollars and decades of time have been put into steering children away from the harmfulness of cigarette addictions, Juul has completely destroyed that very foundation in a matter of weeks. Now, if you own a Juul to carry around with you to class, you are considered to be part of a larger, cooler community. A survey taken by Truth Initiative showed that 1 out of 5 students had seen a Juul while on school grounds. The problem with students gathering in the bathrooms to exchange Juul’s has become so prevalent in Hillsborough County, Florida that many schools in the area are installing “anti-vape” detectors in order to prevent these harmful congregations. Not only are Juul’s becoming increasingly common among school children, the majority of the children who use the product are unaware of how much nicotine one pod contains, and just how addictive the chemical can be. According to the Truth Initiative, one of the largest anti-smoking campaigns in North America, 65% of teens who use Juul accessories are unaware the product contains any nicotine at all. Children have not mentally developed enough to be able to acquire this crippling habit. Nicotine is a serious addictive chemical, and despite the supposed goal of weening past smokers off of the drug healthily, Juul may have created another cigarette culture off of the backs of impressionable kids. Out of the children that are alive today, 1 of 13 will die from a smoke related illness. The chemicals used in e-cigarettes, specifically nicotine, that these young adults are inhaling cause great damage to the brain and stunted development. Before anyone cared to investigate the effects of the cigarette, the world unknowingly held a culture infected by the outcome of predatorial marketing and unethical business procedure. It took years of use, illness, and countless deaths before anyone realized the silent killer that we had all invited into our homes. Now, it’s a matter of time before the realization emerges once again, and history repeats itself. The FDA is not fully aware of the impact associated with Juul. The only feelings of precaution are brought forth by mistakes made in the past, but it seems that it has already passed the threshold of blind following. The Juul may just be a cigarette in disguise.